Just published by Lucky Bat Books is Morgan’s Mill by Bruce Fergusson — whose psychological suspense novel, The Piper’s Sons, made the USA Today and Barnes & Noble bestseller lists, and was nominated for best novel by the Pacific Northwest Booksellers’ Association. In this new suspense book, Fergusson tells a contemporary story of corrosive control, psychotic possessiveness, retribution and redemption, seamlessly weaving in Civil War and Underground Railroad history. 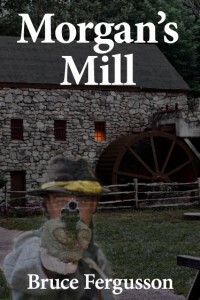 The story: In pursuing the mystery of his grandfather’s disappearance, Thomas Morgan discovers shocking secrets beneath the family’s soon-to-be-razed gristmill that have linked two families in a deadly symbiosis going back to the Civil War, secrets that will thrust Morgan—and the woman he loves—squarely in the sights of a psychopath.